As library users and curious creatures we like to know more. But what if we knew … less? This February, Deschutes Public Library looks at the varied ways in which we can do more with less. From techniques on budgeting and reducing food and plastic waste, to how to transition to green and solar energy, it will be a month filled with insightful and inspiring ways to make the most of what we have. We’ll even hear from local experts on how to declutter your head and physical space with meditation and minimalism. All programs are free and open to the public; registration required for programs marked with an asterisk(*). Sometimes, less is best! Learn how to pay less on your loans, including your mortgage, car loan, and student loans. Financial Coach Alma Lugtu of Small Steps | Big Money paid off her student loans 21 years early, her mortgage 15 years early, and hasn’t had a car loan in over 10 years. She will teach you how to understand your loans and how to strategize to pay less! The continuum of meditation takes us all the way from the very physical practice of progressive relaxation of the body through to practices that take us to the heightened consciousness of unity and selflessness. Given the theme of knowing less, this presentation will offer a few facts and many experiences about a wide variety of meditation practices. In the session we will explore the practical and spiritual aspects of different meditation styles. Space is limited and registration is required; register online. Explore how the stuff we buy, use and get rid of everyday affects our world. From furniture to food, our purchasing decisions and behaviors are where we have the most impact, both positively and negatively. We all know the 3 Rs: Reduce Reuse and Recycle, but while most people focus on the 3rd R—Recycling—it’s Reduce that is the greatest important. 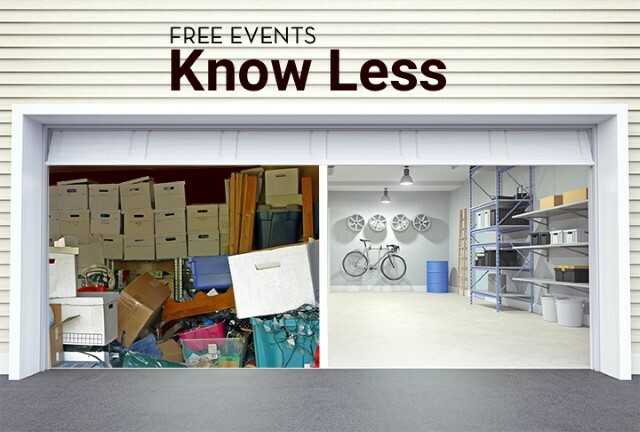 Join staff from The Environmental Center’s Rethink Waste Project to learn more about why stuff matters, globally and here in Deschutes County, and leave with hands-on tips to do something about it. As resource scarcity and climate change have an increasing impact on our modern world, solar energy offers a viable and important solution to our energy needs. This presentation shares the current solar landscape in Central Oregon as well as a global perspective, and also serves as an introduction to how solar energy works and can work for you. Explore what minimalism is, what it isn’t, and how to start with Bend author and editor, Shawn Mihalik. Mihalik began embracing the philosophy of minimalism a decade ago, when he first set out on his own and realized he had too much stuff. Around the same time, he was introduced to the growing wave of bloggers in the minimalism movement, including Leo Babauta of Zen Habits, Joshua Becker of Becoming Minimalist, and then-newcomers Joshua Fields Millburn and Ryan Nicodemus of TheMinimalists.com. For more information about these programs, please visit the library website at www.deschuteslibrary.org. People with disabilities needing accommodations (alternative formats, seating or auxiliary aides) should contact Liz Goodrich at lizg@deschuteslibrary.org or 541-312-1032.